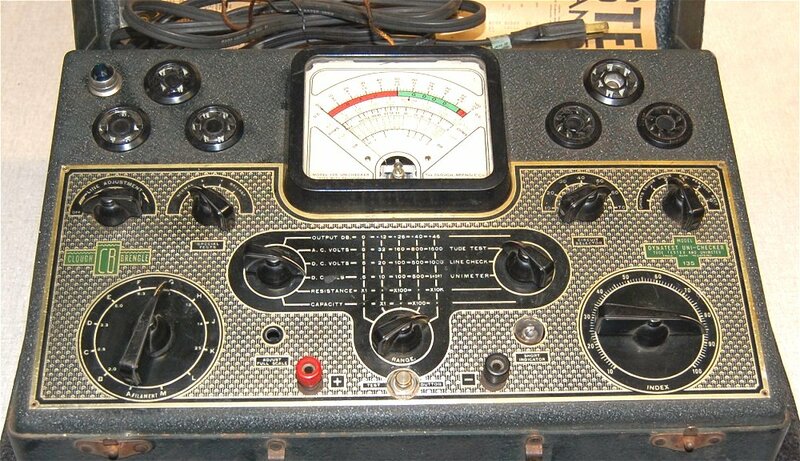 Vintage test equipment in my collection from the 1920s through the 1960s. Here is an very early Montgomery Ward tube tester model 5156 that only tests 4 pin tubes from the 20s. 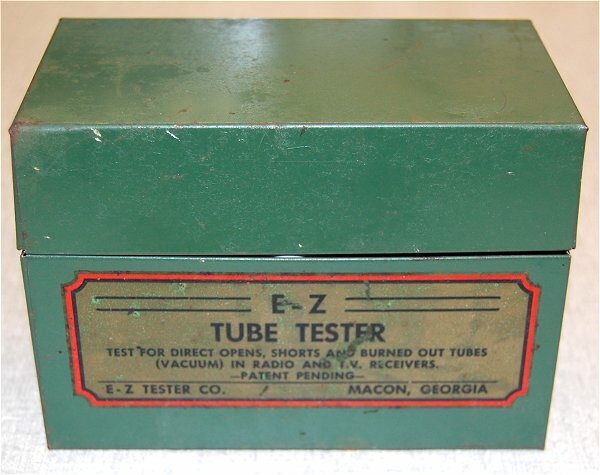 (Let me know if you have any info on it) This tester plugs into the tube socket in the radio and the tube under test plugs into the tester. 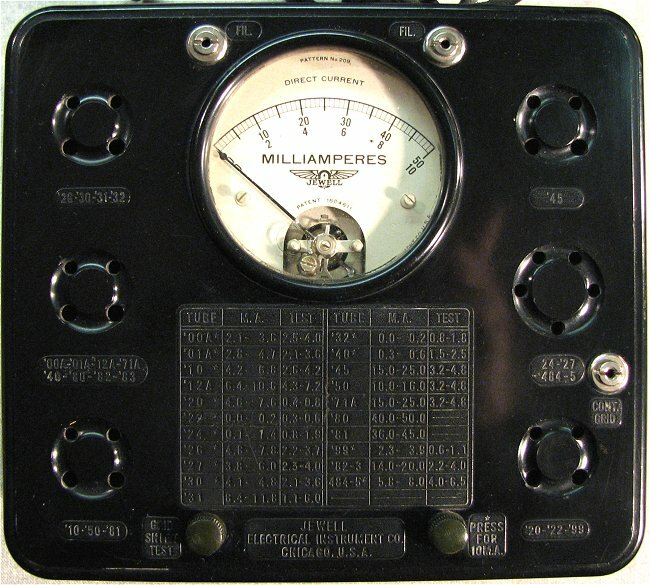 The meter can be moved from the "A" position to the "B" position to test the plate and the grid side of the tube. 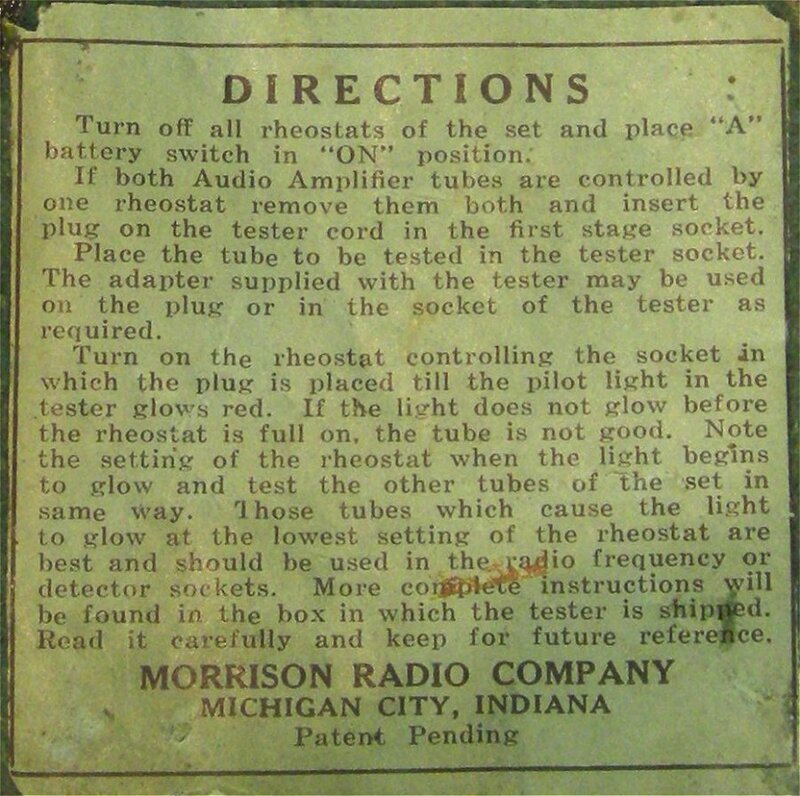 Here is another early tube tester manufactured by Morrison Radio Company, Michigan City Indiana and distributed by Montgomery Ward. 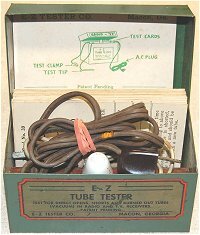 It only tests early 4 pin tubes from the 20s. 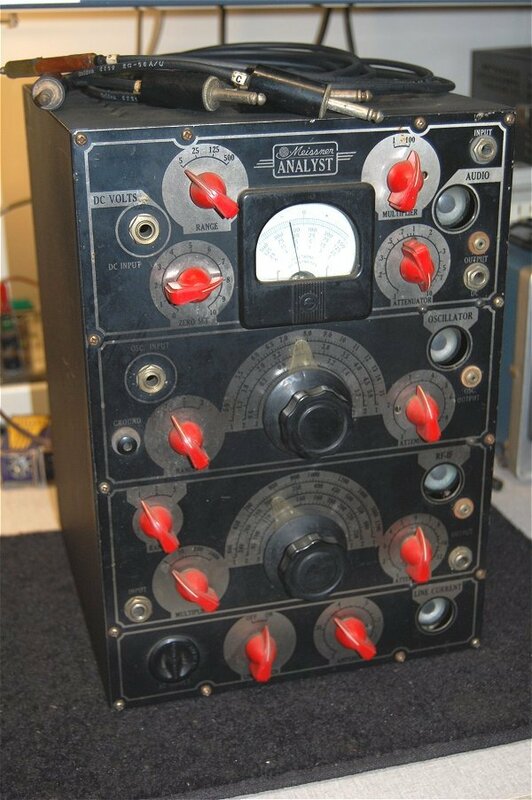 This is a radio battery tester from the early 1900's. 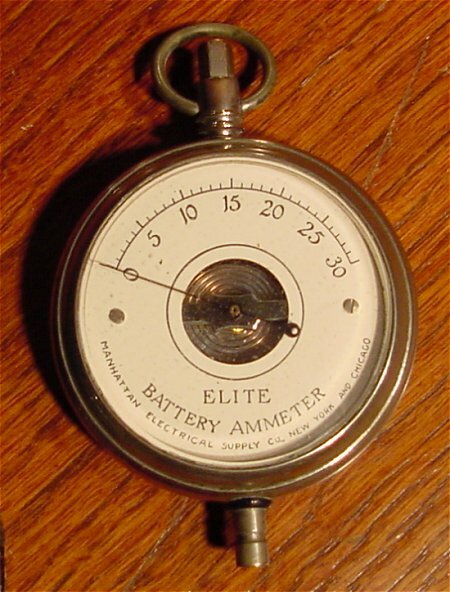 It is about the size and style of a pocket watch. 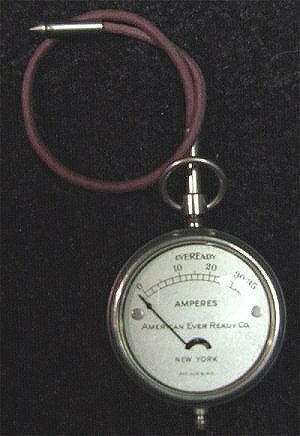 It was used to check the current level (0-35 Amperes) in the batteries of 1920's radios. 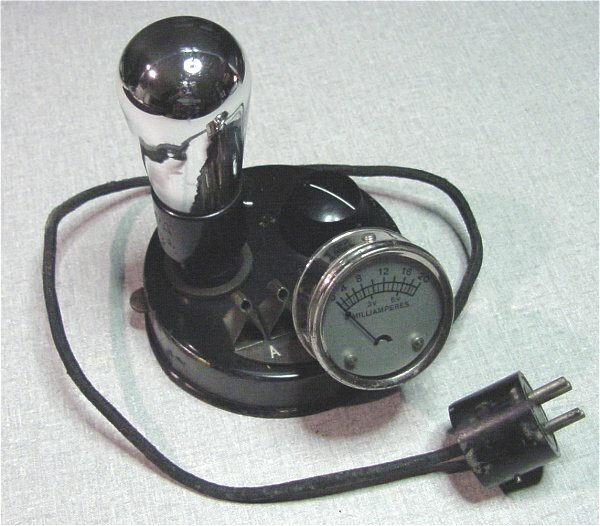 This meter is marked on the face with "EVEREADY" and a patent date of Aug. 9, 1910. 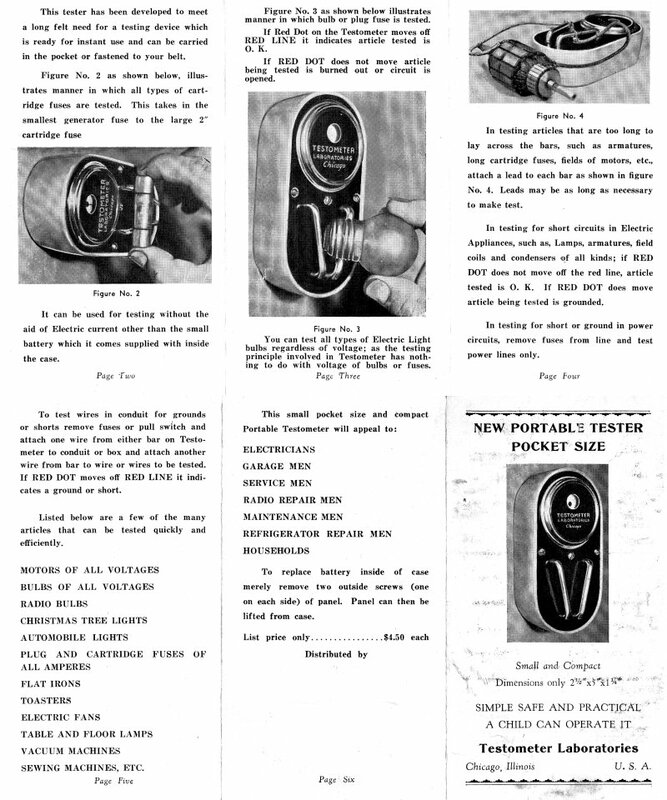 It was manufactured by the American Ever Ready Co. 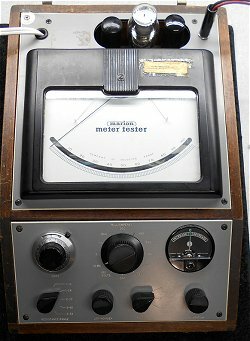 This meter is in excellent working condition and makes a great addition to my radio collection. 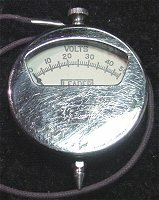 Leader measures 0-15 A, 0-50 VDC. 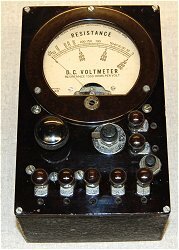 The Manhattan DC Polarity-Indicator was patented in 1905 and shows polarity in a DC circuit using a liquid in a glass tube that when current is passed through it, the liquid in the negative end turns red. 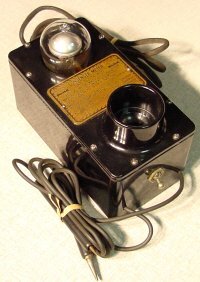 It has a patent date stamped on it of Oct. 25, 1905. The earliest ad I have found for it was published in 1903. 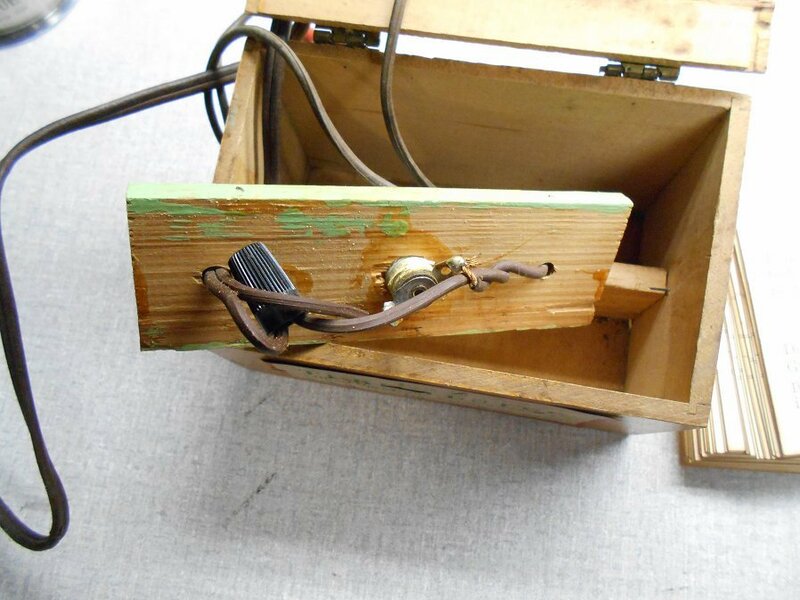 It was available in two models, a model 3220 for testing the polarity of low voltage DC and battery charging circuits and a model 3221 for testing 50-600 volt DC circuits. 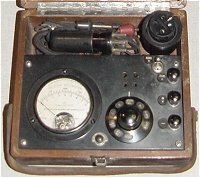 They use a liquid filled glass tube that is incased in a hard rubber type case with a connector on each end. 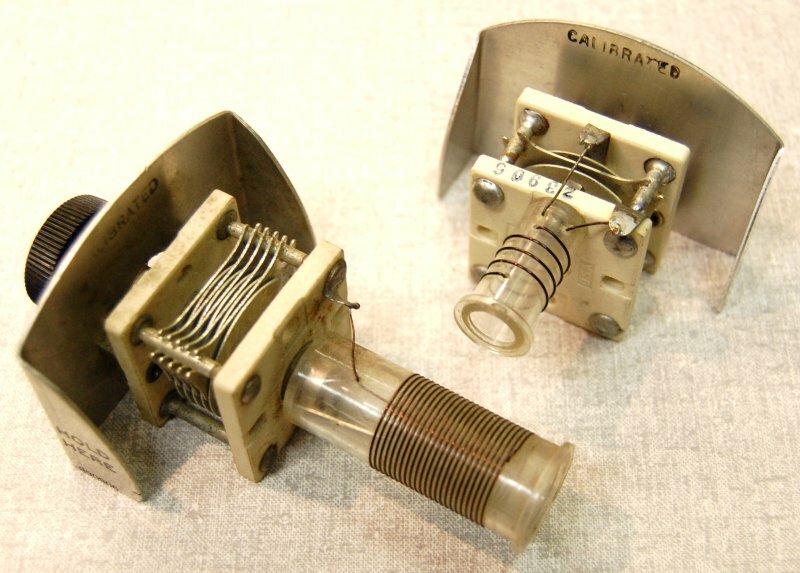 Electrodes inside the glass tube attach to the connectors. The metal sleeve can be rotated to cover the glass windows when carried in your pocket. 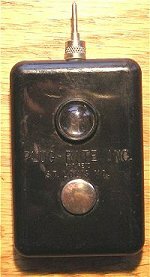 Manufactured by the Manhattan Electrical Supply Company (MESCO), Jersey City NJ. I tested one of my battery models. The liquid in the end with negative 25 volts DC attached turned dark red after only a few seconds. 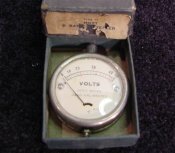 Like the DC Polarity-Indicator above, this meter is also manufactured by the Manhattan Electrical Supply Company. 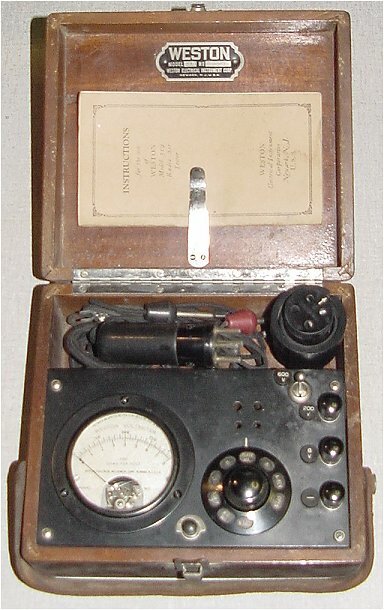 It was used by the radio operator to test the batteries used to operate the radios of the 1920's. It's about the size of a pocket watch. Note the nice lettering on the face. 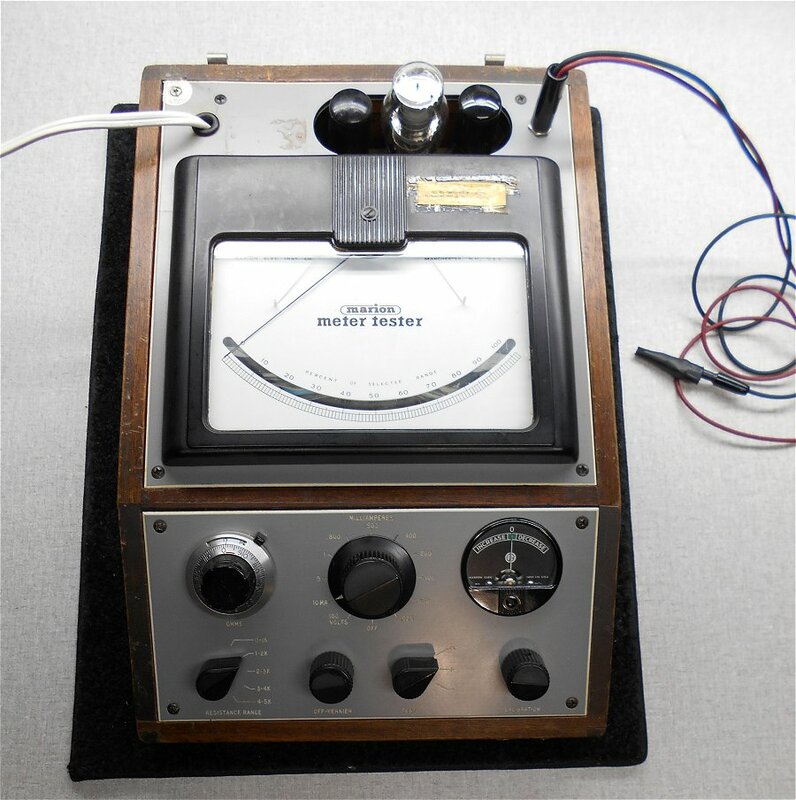 Clarostat Tube Type Line Cord Resistor Tester - metal case with etched face plate. 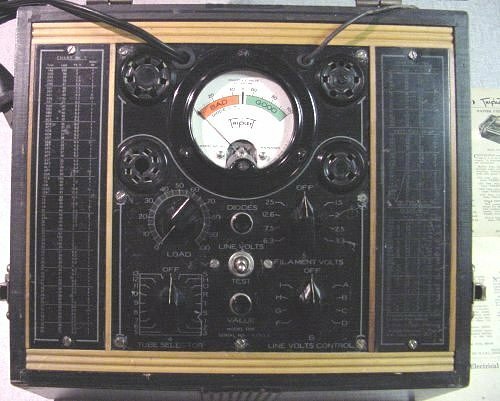 Clough-Brengle model 135 "Dynatest Uni-Checker". 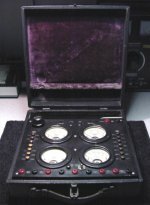 This portable Clough-Brengle tube tester has a full metal case and cover. 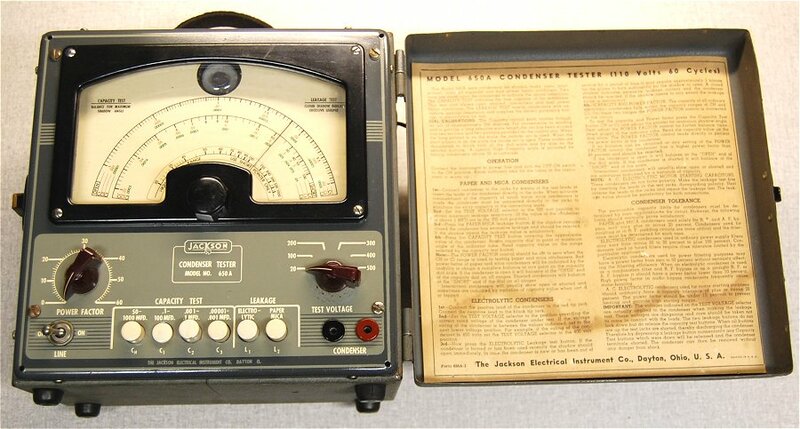 Here is the Great Granddaddy of all corner drug store tube testers. This was made for radio shops front counters. 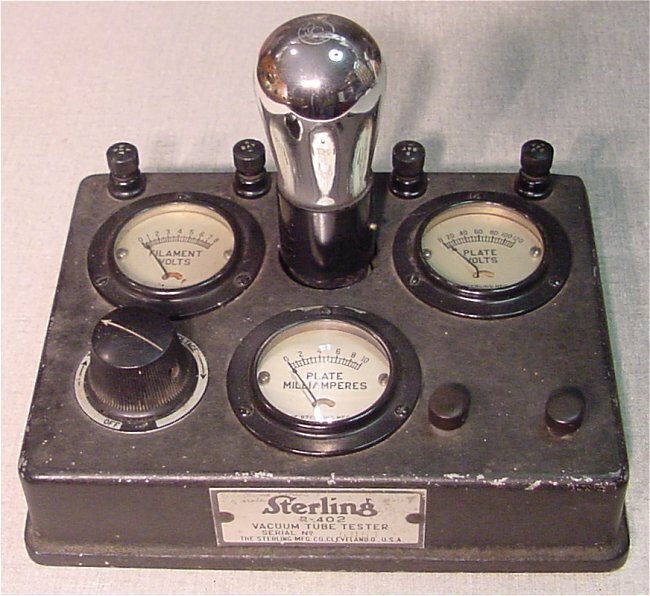 It's an early Supreme 85C Tube Tester designed to allow customers to test their own vacuum tubes. 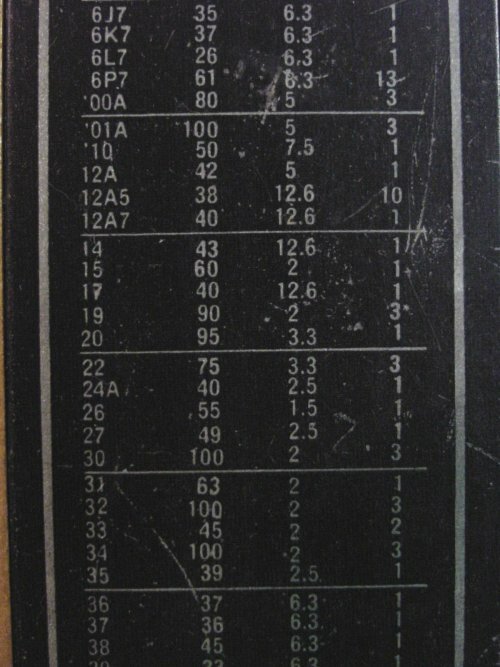 The tube chart and operating instructions pull out on a wooden slide from the front bottom. Pic 1 Pic 2 Need the Data Sheet? 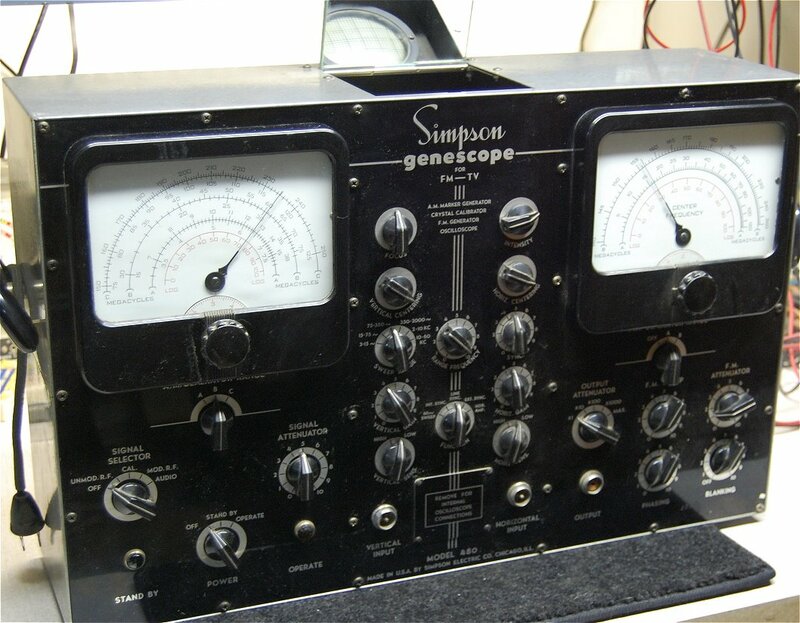 View over 200 items in my Supreme test equipment collection at my Supreme Instruments web site. 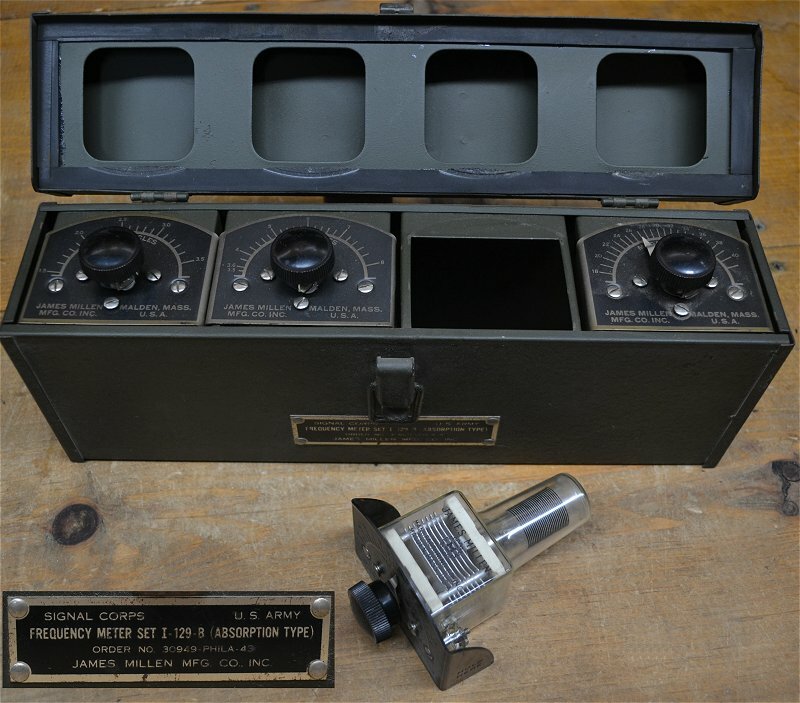 in Little Rock Arkansas and manufactured these "Confidence" and other model tube testers. 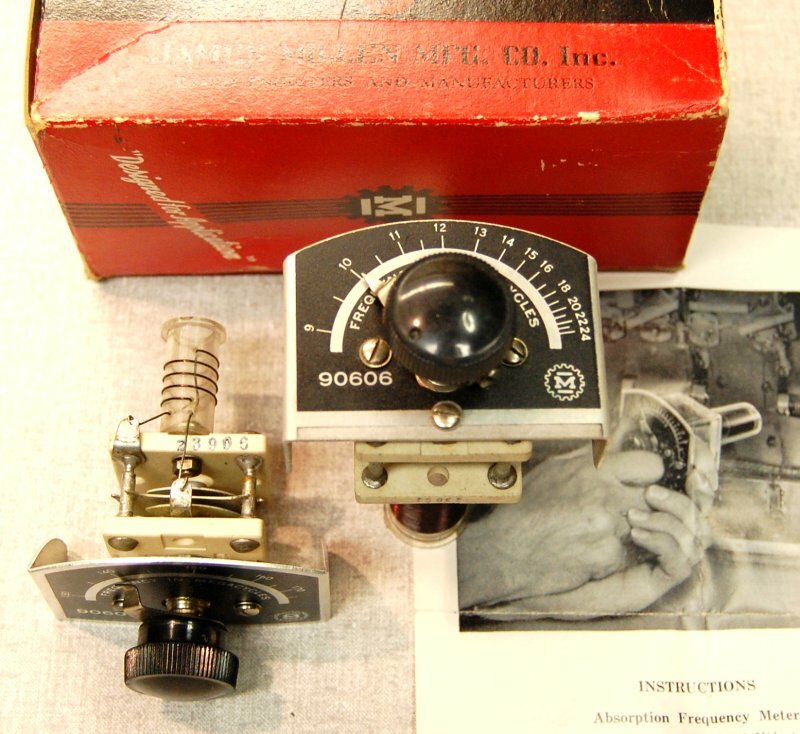 Find more information on the Apparatus Design Company and Confidence Tube Testers in my collection here. This is one of the earliest Hickok meters I have seen. 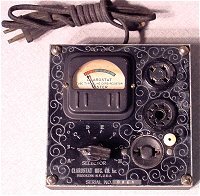 It is marked Model 48 on the face of the meter. 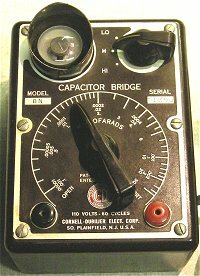 It measurers resistance (Ohms) and DC voltage. From the construction I'd place it in the late 1920's. 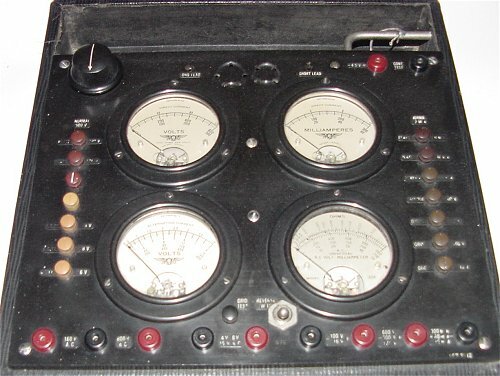 It uses the same style of parts as the SG-4600 Tube Tester. 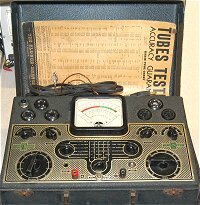 Here is an early Model 1310 Triplett tube tester that tests early 4 and 5 pin tubes from the 20s and 30s. 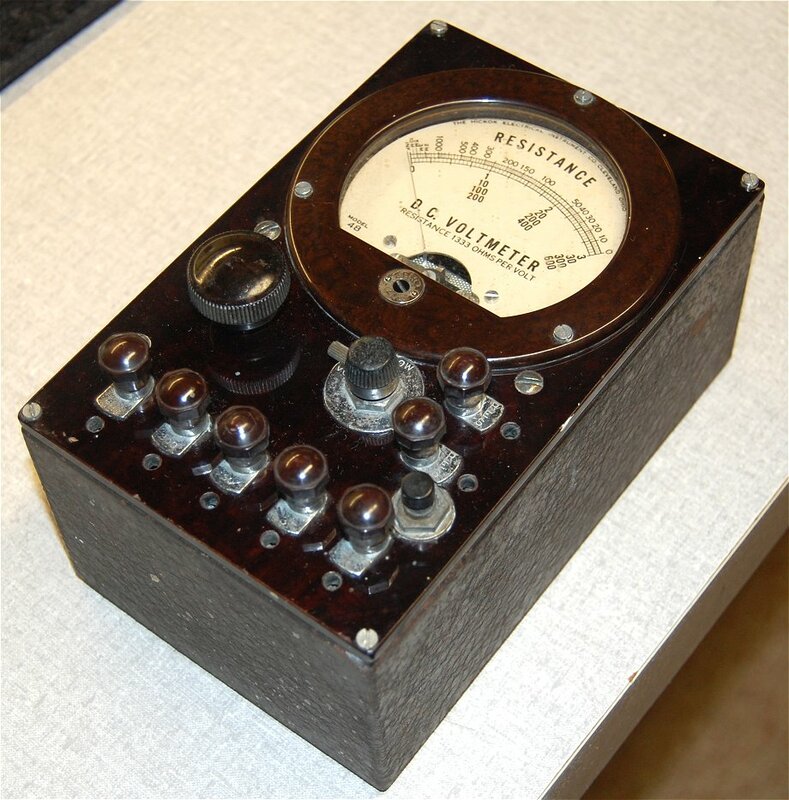 This is a working Tester which uses an 01A tube. The tube settings are listed on the metal plates on each side of the face (Pic 4). 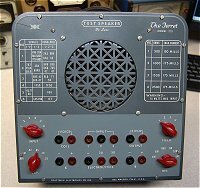 This is a early Jewell Tube Tester (Pattern 135). 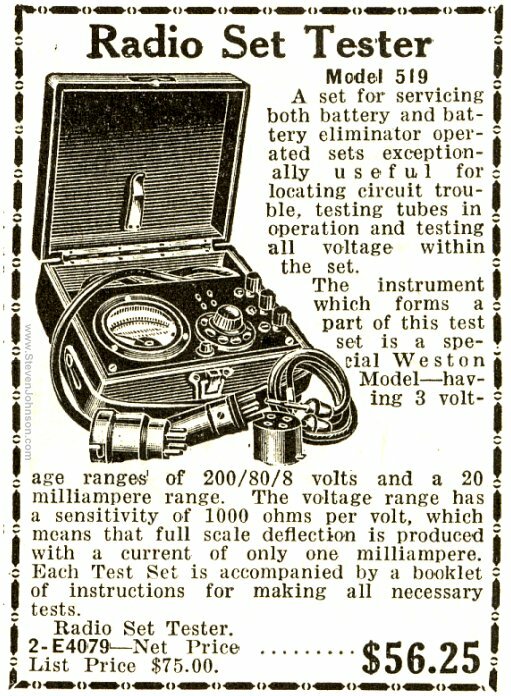 It only tested early 4 pin radio vacuum tubes. 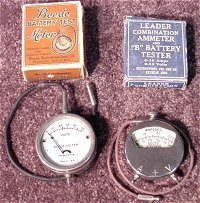 This tester was battery powered or could use a cord from the radio socket to power the tube under test. 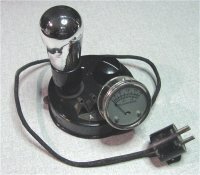 This is a bakelite Jewell Tube Tester (Pattern 209) from 1932. 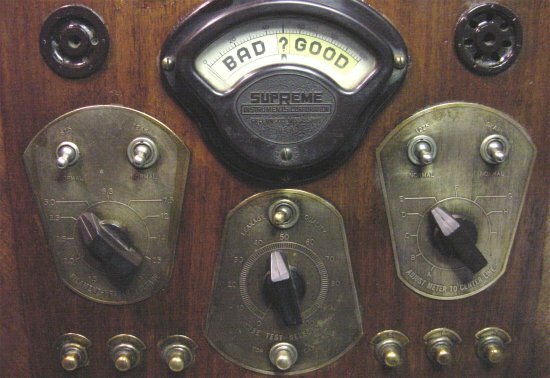 It tested 21 different early 4 pin and 5 pin radio vacuum tubes. Tube settings are molded on the face. 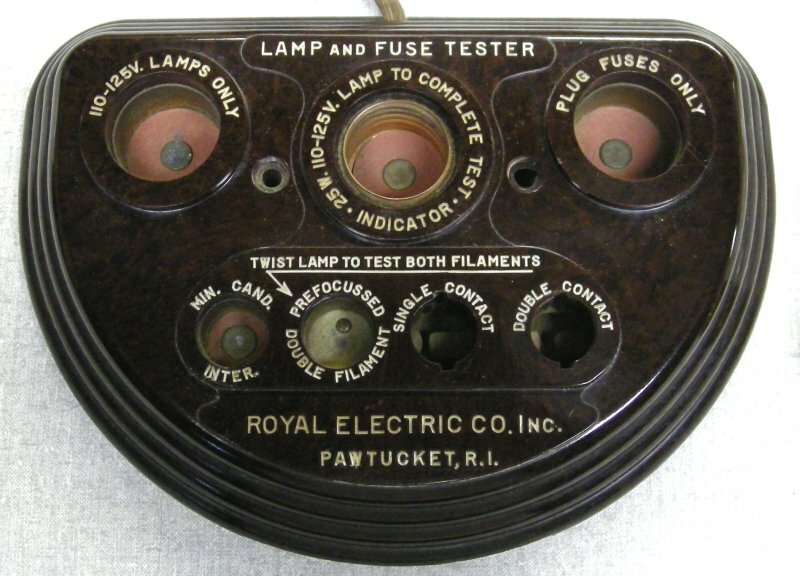 This tester was AC powered. 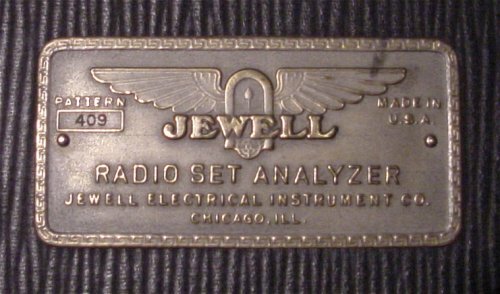 This is a Jewell Radio Set Analyzer (Pattern 409) from the 1920s. 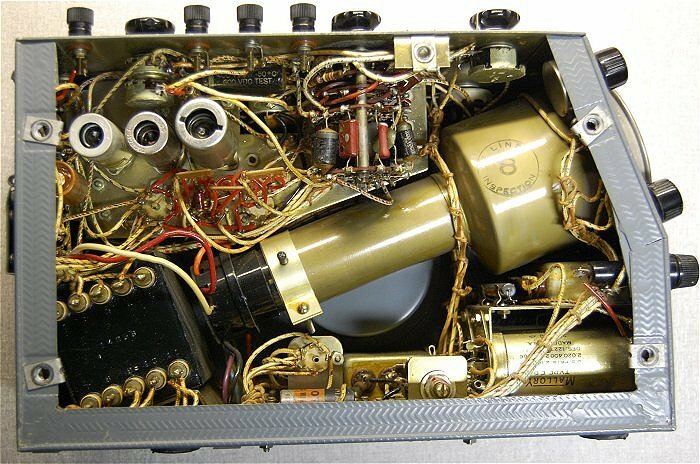 It was able to make most measurements the radio repair man of the day needed to troubleshoot radio circuits. 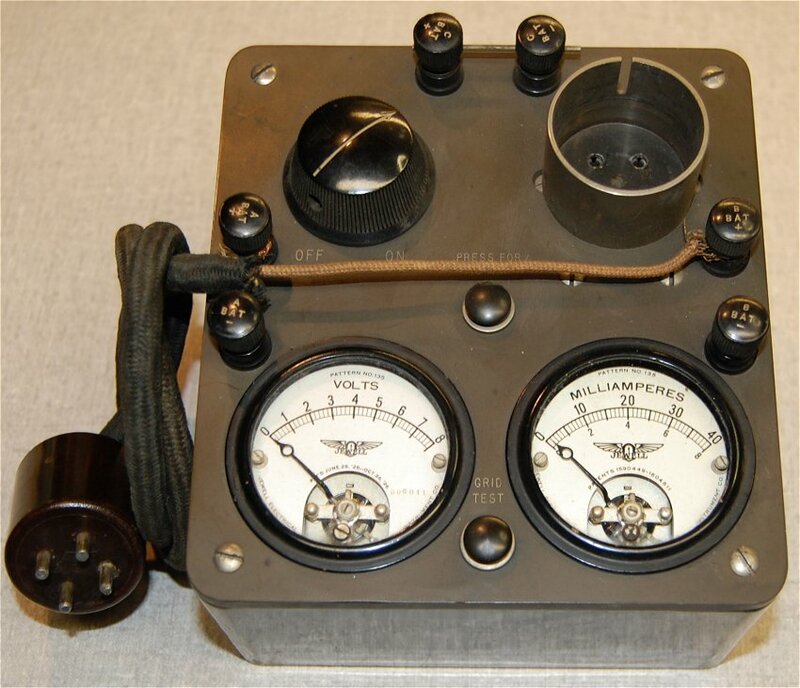 This tested early 4 pin and early 5 pin radio vacuum tubes. 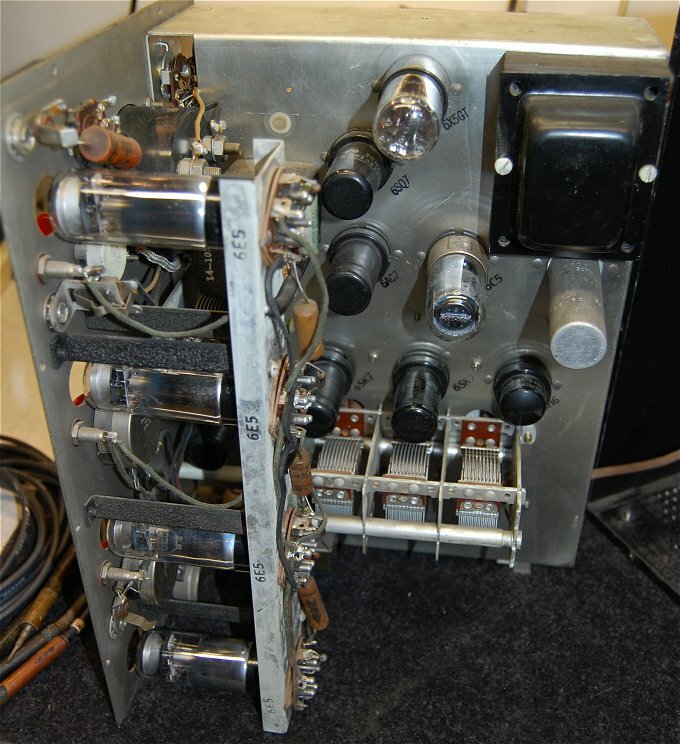 Unit had cord that pluged into the radio's tube socket and tube was then inserted into the analyzer. Used to check 1920's radio batteries. 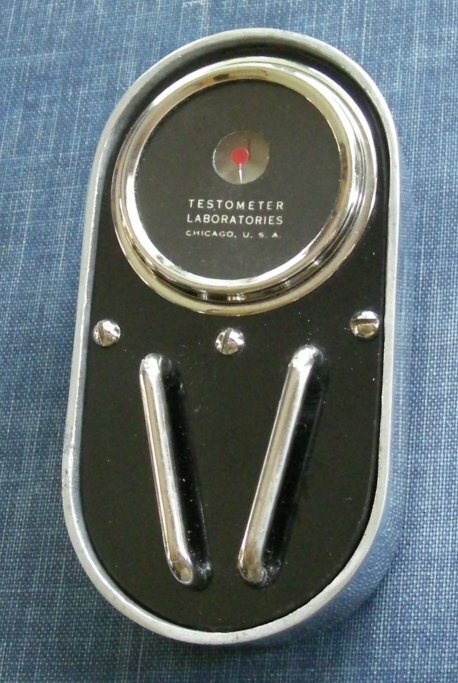 This unique little tester has a heavy duty chrome case. 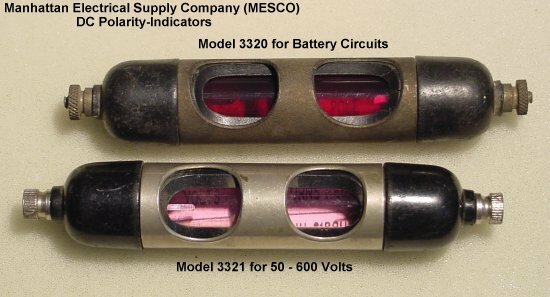 It was designed to quickly check Continuity of fuses, lamps, motor windings, toasters, flat irons, vacuum machines, and anything else you can possibly get across the two contact bars on the face. 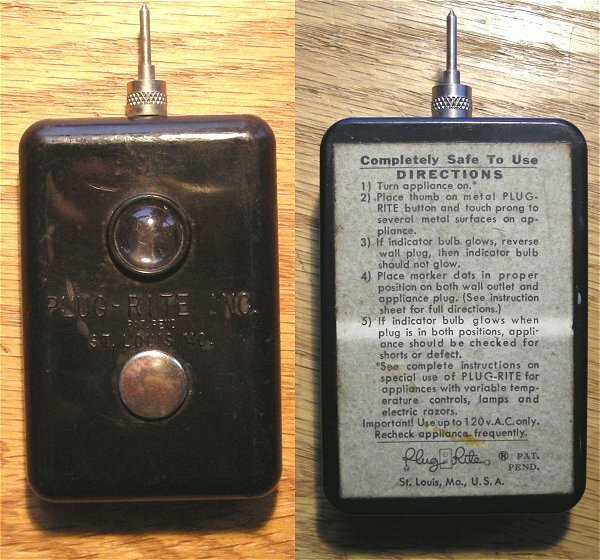 This Plug-Rite tester was used for checking if the radio or appliance's two prong plug is plugged in correctly. 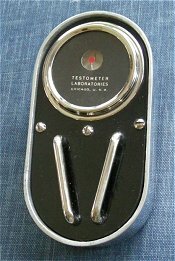 You put your thumb on the metal button and touch the tip to a metal part of the appliance or radio chassis. If the lamp in the window glows, reverse the plug. I tried it and it works. I was not grounded (probably a good thing) so I'll have to tear it apart to see how it works. 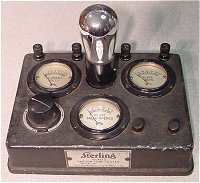 Sterling R-402 Vacuum Tube Tester Early battery powered Sterling model R-402 tube tester. 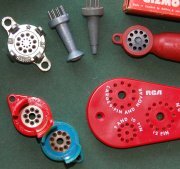 Sterling R-403 Vacuum Tube Reactivator with instructions (and the original box) for making those old 4 pin tubes "Like New" again. This filament rejuvenation or "flashing" on weaker tubes was successful to some degree on a few older tubes like the 01As with Thorated Tungsten filaments. 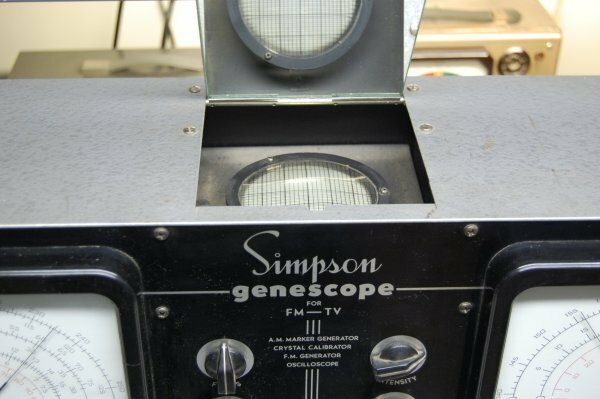 The model 480 Genescope is three service instruments in one. 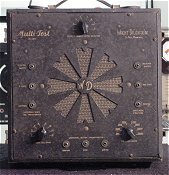 It contains an Amplitude Modulated Oscillator for AM service, a Frequency Modulated Oscillator for working on FM and TV receivers, and a full function oscilloscope. 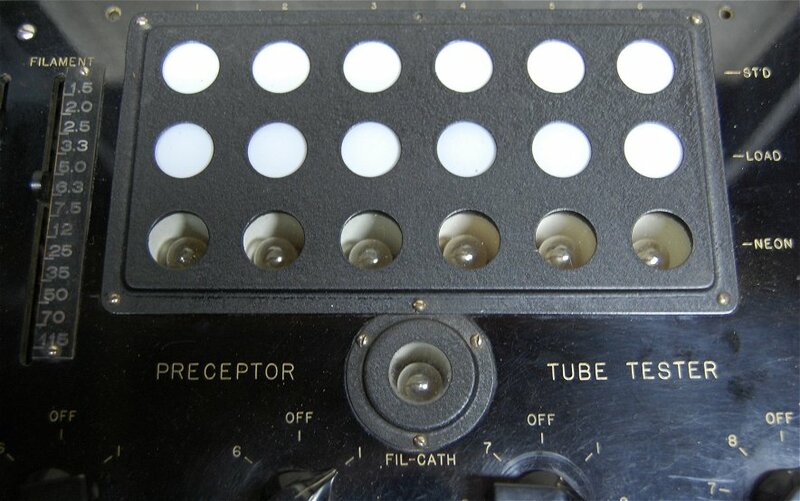 The oscilloscope tube is mounted vertically and the display is viewed using a hinged mirror on the top of the cabinet. 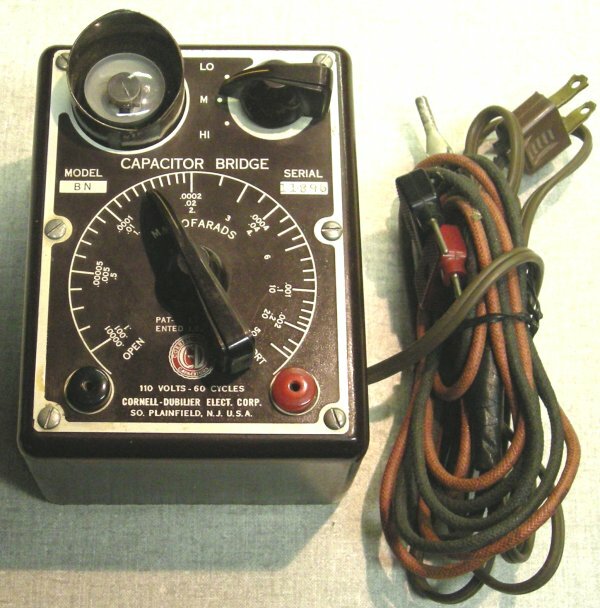 Nice little capacitor tester with a large dial and eye tube. 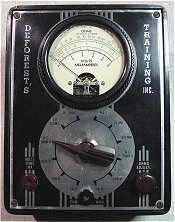 Very handy instrument for testing many types of DC panel meters by the Marion Electrical Instrument Company, Manchester New Hampshire. 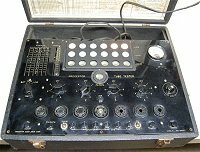 This is a version of the Navy OS-8 B/U Oscilloscope. It has a 3" CRT. The holes in the sides are for storing the power cord and probes when packed in it's case. 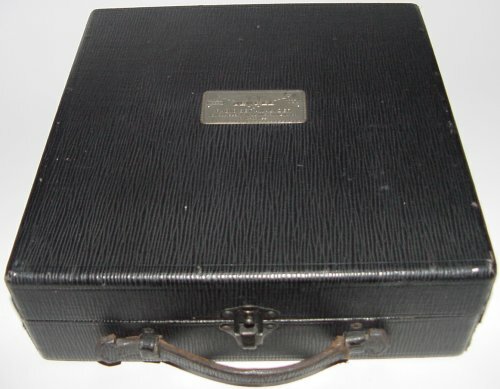 Manufacturer is unknown but it may have been made by Hickok. 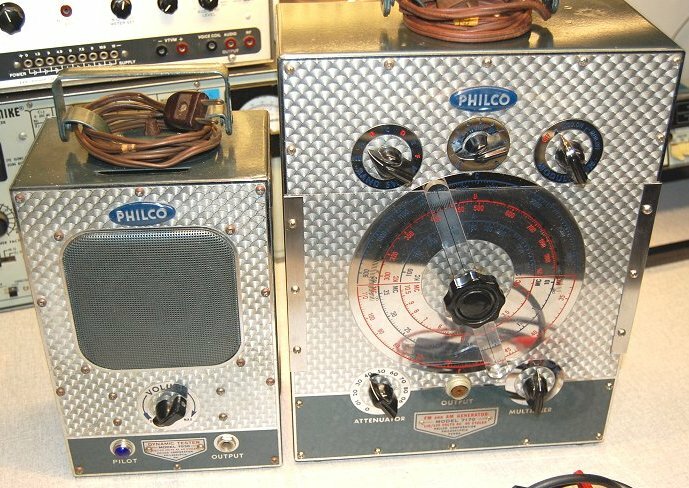 A beautiful combination of bench test gear by Philco. 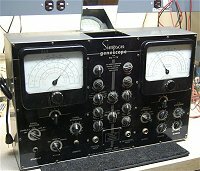 The model 7030 "Dynamic Tester" - signal tracer (left) and the matching model 7170 FM & AM Signal Generator (right). The signal tracer has a compartment in the left side for the probe storage. The brushed and mirror finish makes these two stand out on any repair bench. 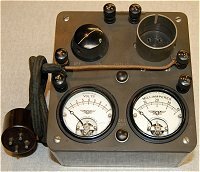 The Rider Chanalyst is designed to allow the serviceman to listen to and measure the signal as it passes through each of the components in a receiver. 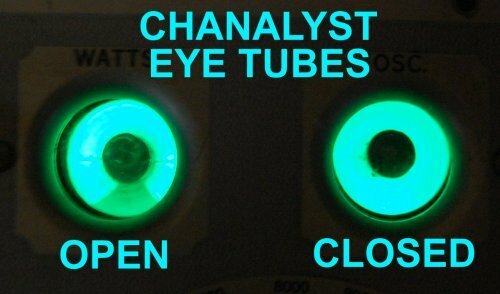 The Chanalyst has four tuning eye tubes. 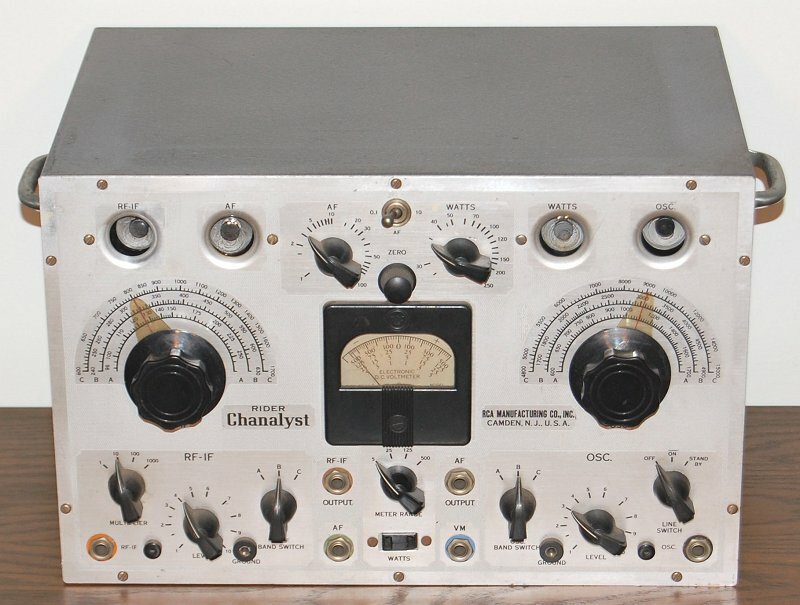 More Chanalyst data and manuals are available here. 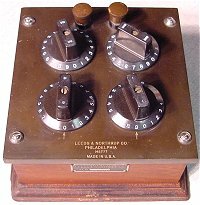 The Meissner Analyst is designed to allow the serviceman to listen to and measure the signal as it passes through each of the components in a receiver. This model Meissner Analyst has four tuning eye tubes. 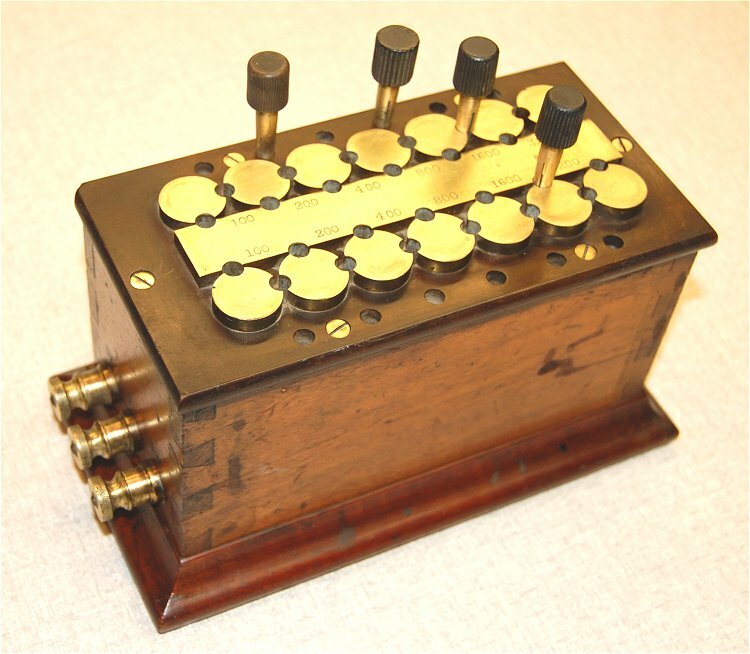 The first model had five. 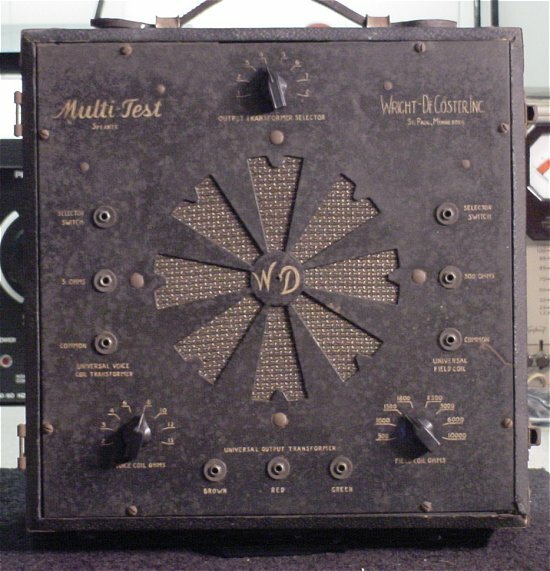 This is a very unique piece of test gear. It uses a similar if not a direct copy of the the Rider Chanalyst circuit above. 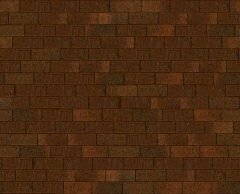 Model BN. This compact Cornell Dubilier unit has 3 ranges and uses an eye tube as an indicator. 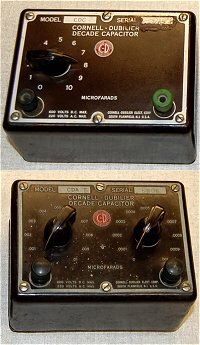 The model CDC3 has ten positions from 1 to 10 Microfarads, The CDC5 covers .01 to .0009 Microfarads with two ten position switches. 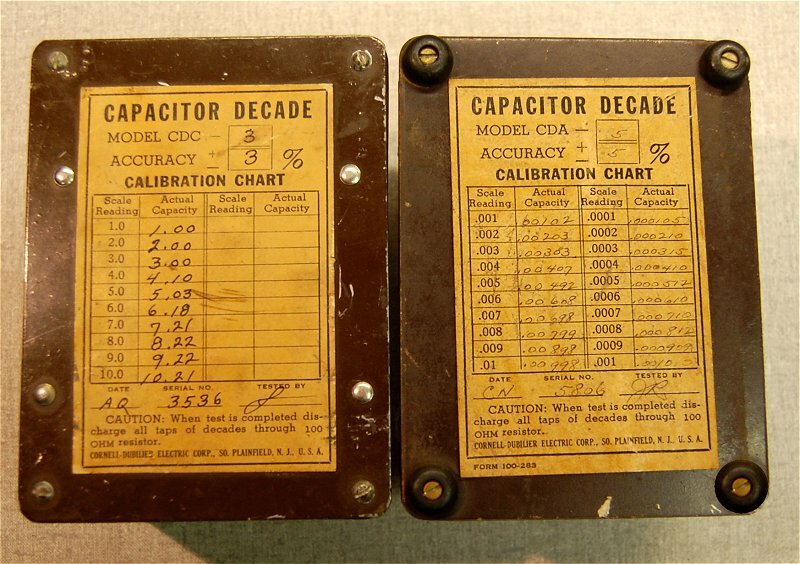 Both have calibration charts from the factory on the bottom. Has 4 range selectors 1 ohm, 10, ohms, 100 ohms, and 1000 ohms. Tested, very acruate. Nice wood case. Has 4 brass range selecting posts. 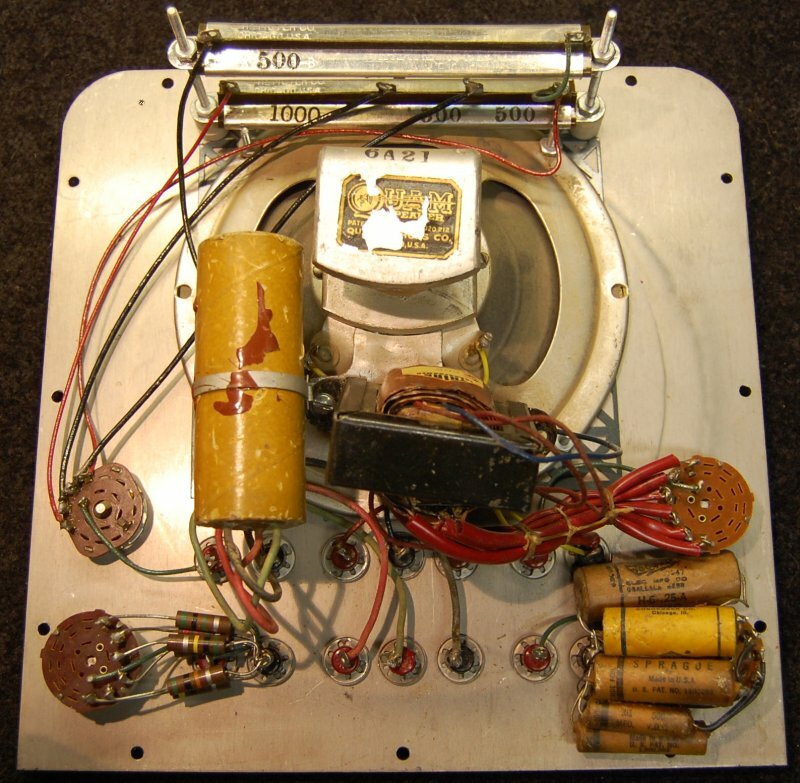 Each side has coils of resistor wire under each brass cap. You can select parallel and series resistance combinations by inserting all 4 posts at various points. My guess is that this was used as a training item. 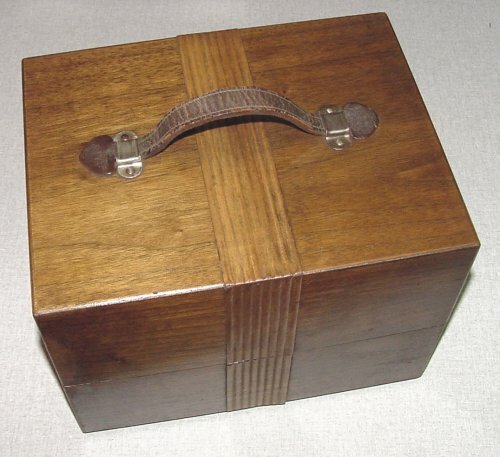 Nice wood case. 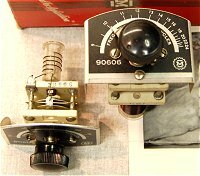 Tests AC/DC Volts and Milliamps. 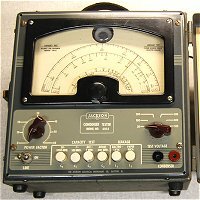 Uses a Simpson model 85 meter. 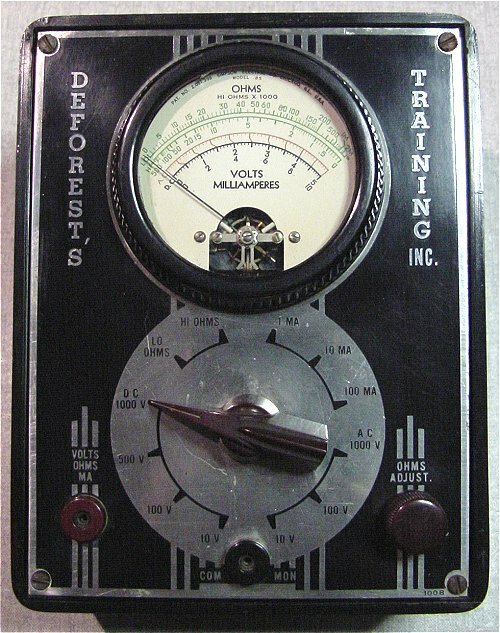 This meter was supplied in 1950 by DeForest's Training Inc. to it's students. 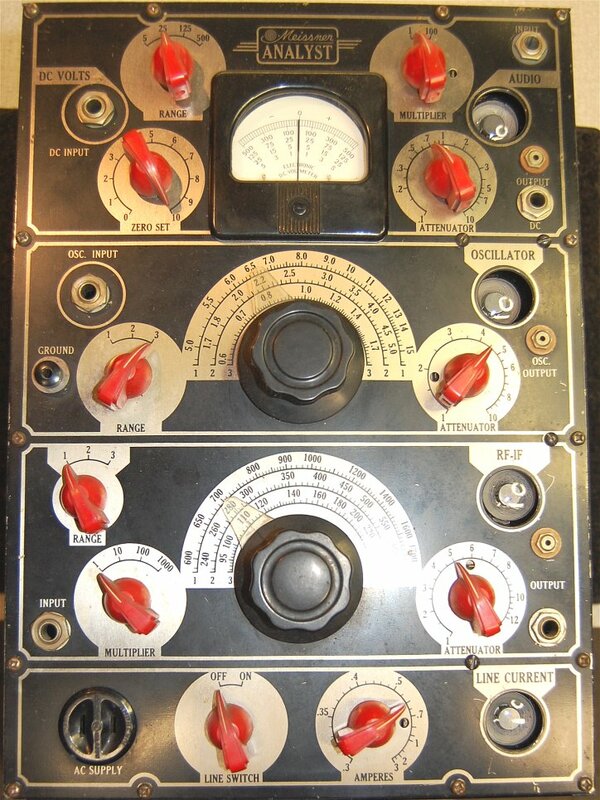 This is designed for the 1930's radio test bench. 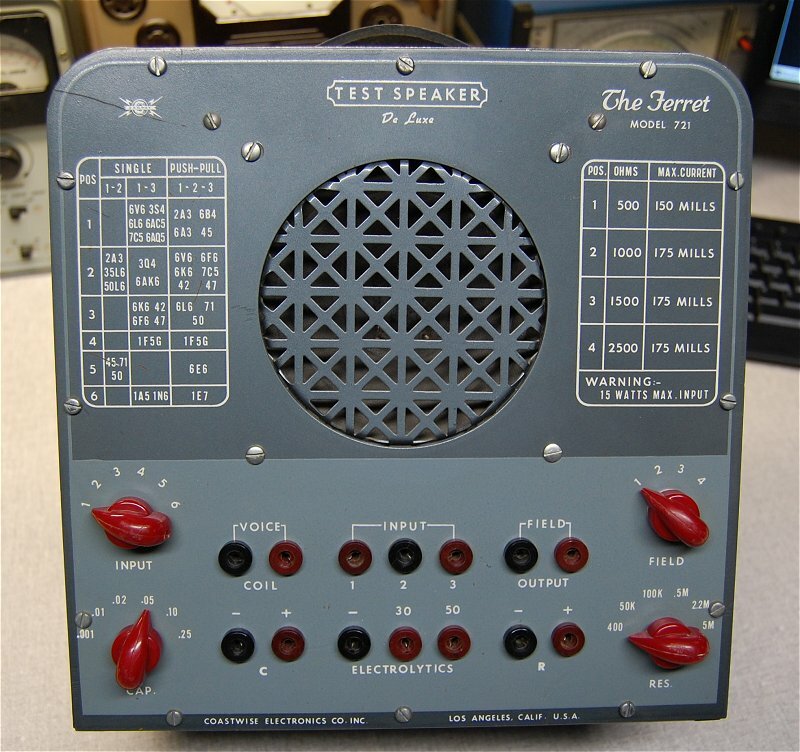 Has selectable field coil resistance, transformer taps, and speaker impedance. 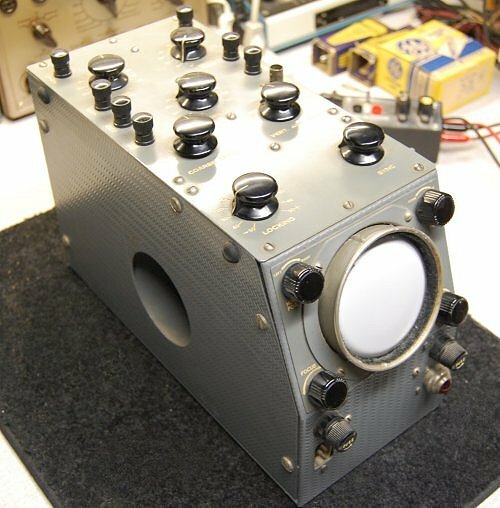 This test speaker built by Coastwise Electronics in 1947 is also is designed for the radio test bench. 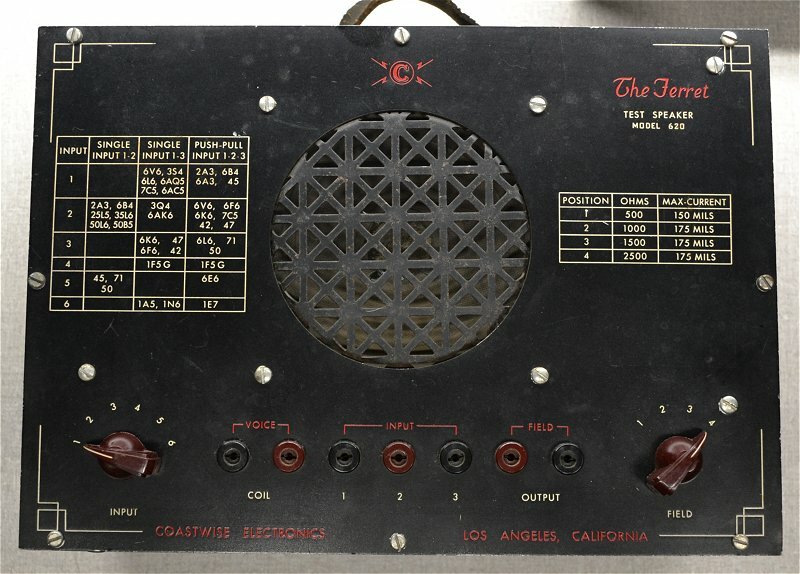 It has selectable field coil resistance and speaker impedance (top row). 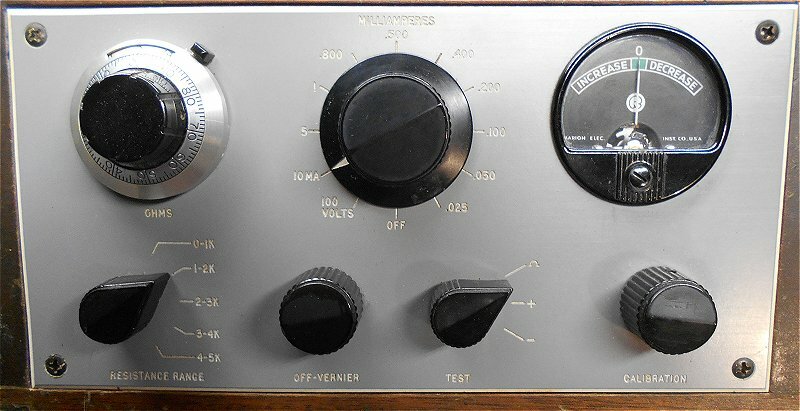 Input settings are selected by chart at left according to radios output tube. 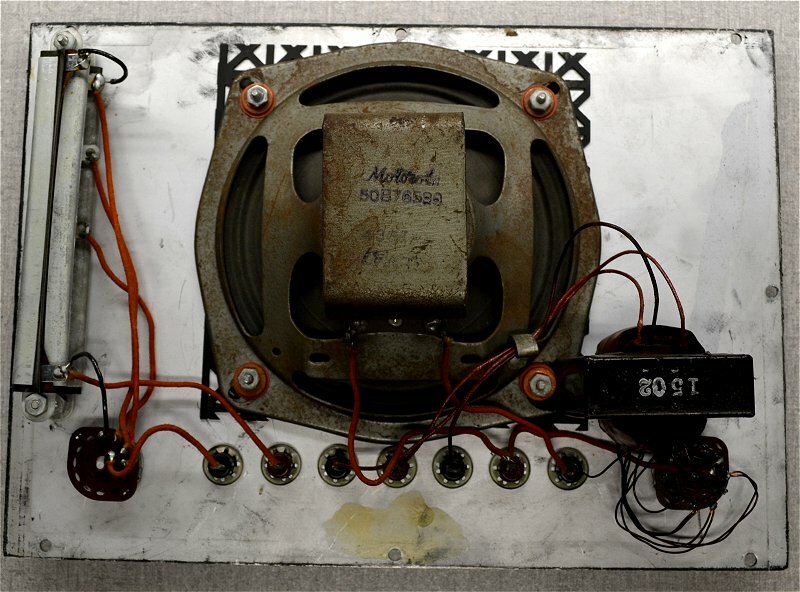 This model 620 test speaker by Coastwise Electronics is similar to the 721 above but is only the speaker section without the capacitor and resistor substitution box. 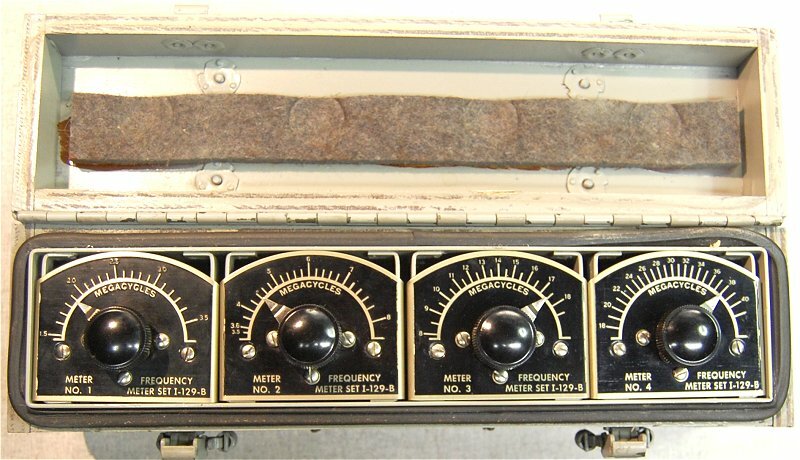 These hand held absorption frequency meters are used to measure the frequency of an oscillator or find harmonics. 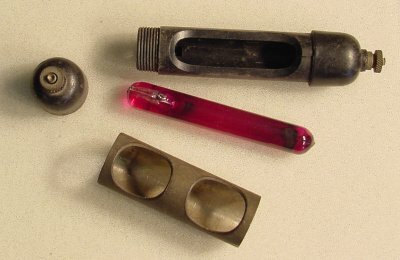 This set was manufactured by the James Millen Manufacturing Co. in Malden Mass. 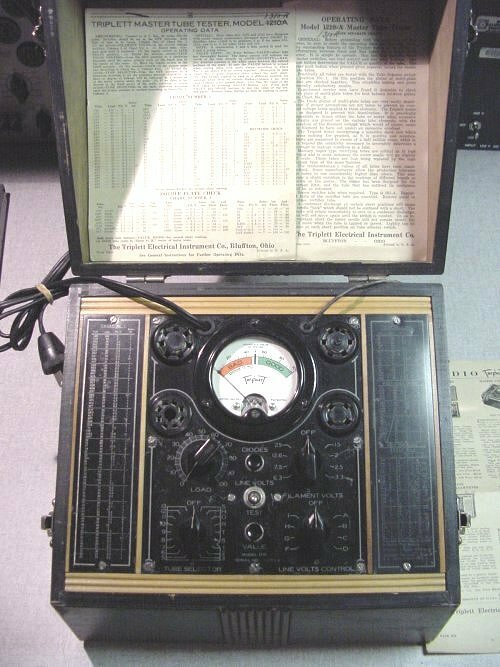 Manufactured by the Preceptor Electrical Corp., this model K tube tester is a little different as it uses 12 lights with different levels of brightness to indicate tube quality and seven neon lamps to indicate shorts. There is a set of six standard lamps which are set to individual brightness levels as called out in the setup chart. To measure tube quality, the brightness of the Load lamps are then each compared with the corresponding standard lamps. The small meter in the upper right is to set the AC line voltage. This is about as basic as it gets. 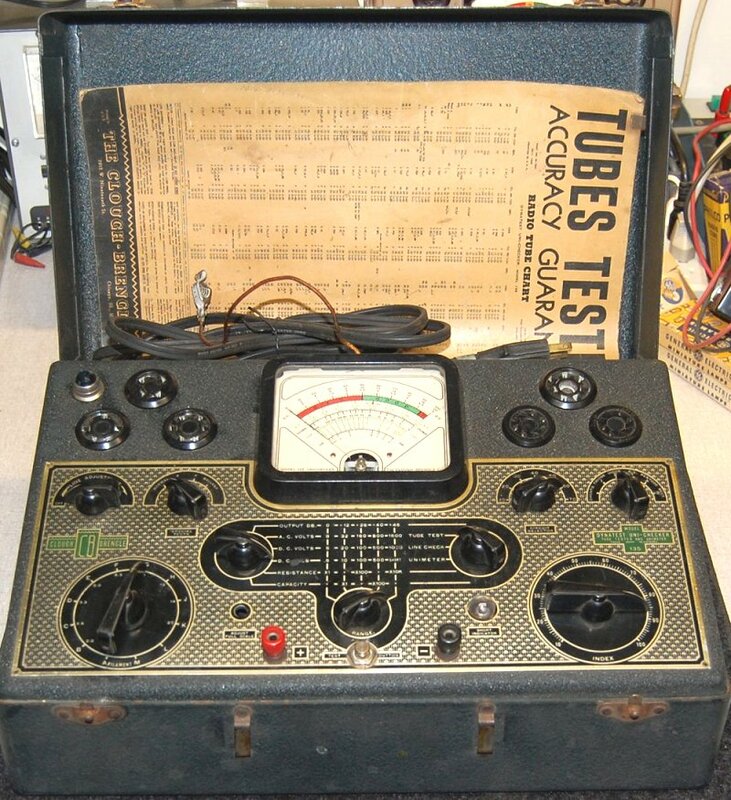 This 1952 era tube tester is made from a standard 3x5 file card box and a piece of wood with a 110V Christmas tree lamp wired in series with the test leads. 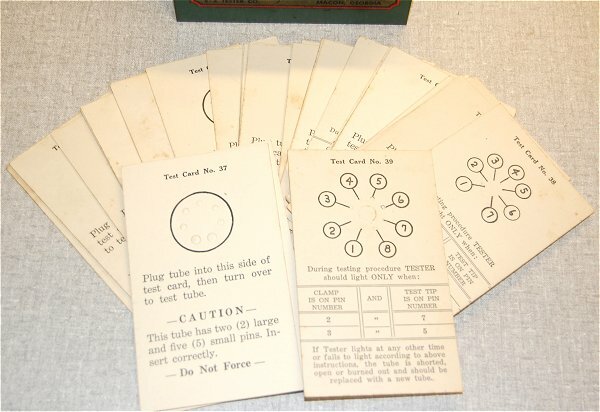 It comes with 39 test cards. You place the tube pins through the proper card and use the test leads across the pins to check the filament and for shorts! 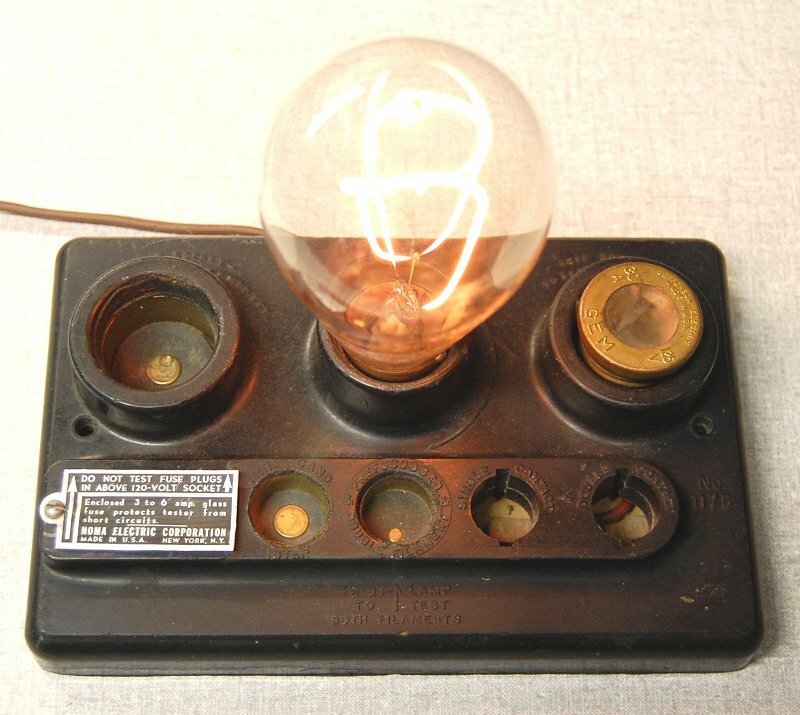 The lamp acts like a little Dim Bulb Tester for tubes. 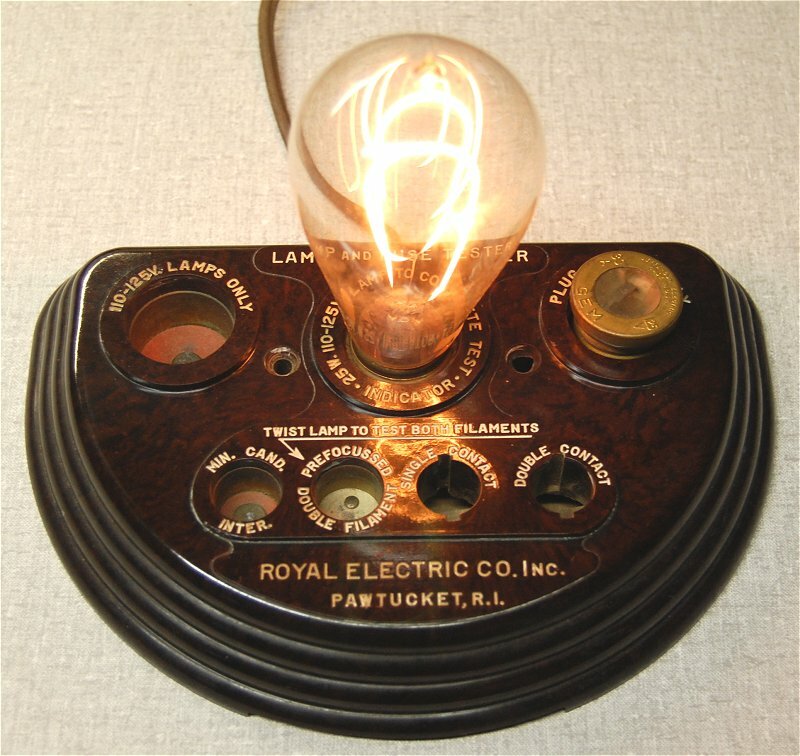 Manufactured by the Royal Electric Co., this bakelite lamp and fuse tester is designed for setting on a counter or can be mounted on a wall. It is powered by standard AC line voltage. 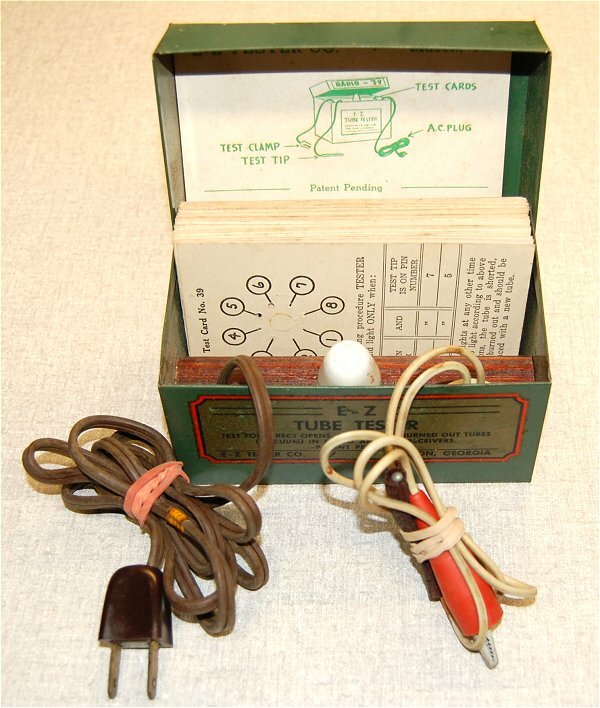 Manufactured by Noma Electric Corp., this fuse and lamp tester is designed for setting on a counter or can be mounted on a wall. It is powered by standard AC line voltage. It appears to be made from some type of hard rubber. 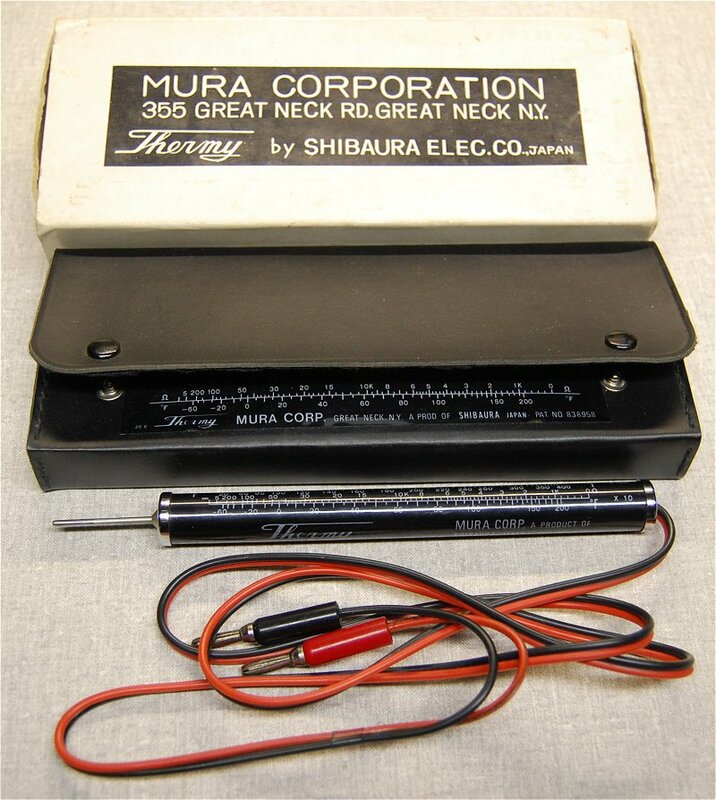 Manufactured by Shibaura Electric Corp. Japan. 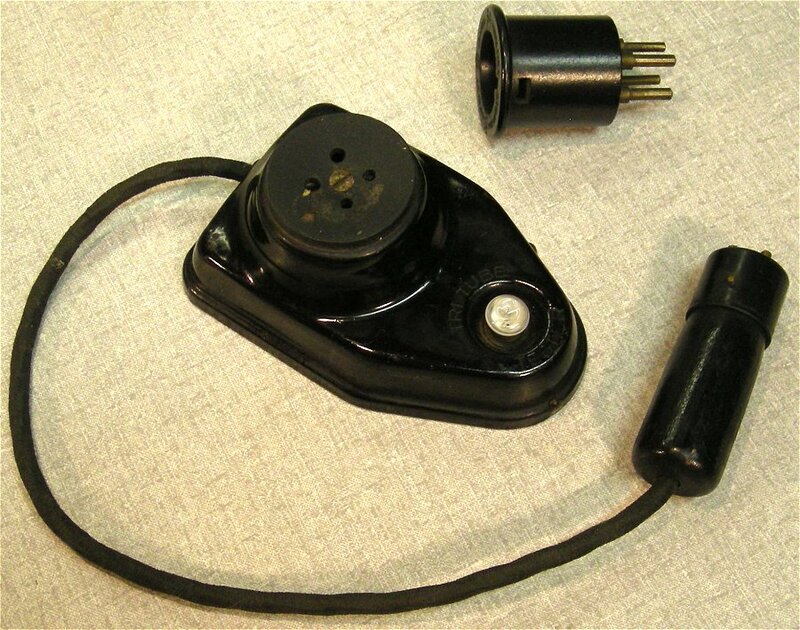 This temperature probe plugs into a standard analog ot digital ohm meter. It's resistance changes with temperature and you convert the ohms reading to temperature (F or C) using the scales on the probe. Cost in 1973 was $12.50. 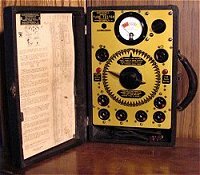 In the 1960s and 1970s Don Bosco Electronics manufactured a line of shirt pocket sized signal tracers and generators called the "Stethotracer" and "Mosquito". 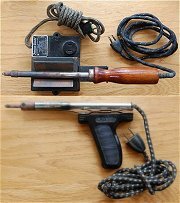 Some of the vintage soldering guns and irons I have collected and soldering tools I currently use on my work bench. 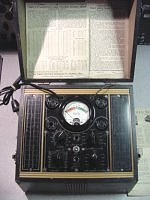 Here are some of my cardboard calculators (better known as Slide Charts and Wheel Charts) and cards that relate to servicing antique radios and electronics in general. Included are some of my slide rule type calculators made from cardboard as well as some wheel type cardboard calculators. "Tube Pin Straightener" collection and she said that's going off the deep end. Oh well, here they are. 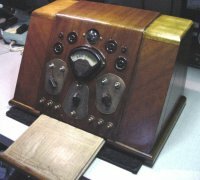 People often ask me what test equipment and tools I use to work on old radios so here is a picture and more details of what I use on my electronics bench.